Phew. “Secondhand Spoke” is just a solid, middle-of-the-road episode of Family Guy, and after the last couple of weeks, that’s all I really wanted. Everything in this episode is pretty straightforward, within the bounds of the characters (for the most part), and doesn’t use horrible sources of humor. Exhale (with smoke). The good qualities of this episode are immediately apparent, when, after a brief scene of Chris getting bullied to set up the B-story, we jump right into the main plot: Peter getting addicted to cigarettes. Starting the main story without a few minutes of unrelated material is rare for this show, and it calls attention to how tightly plotted this episode is for a half-hour of Family Guy. Peter’s reasons for getting into smoking—getting to take smoke breaks during work—isn’t the worst reason to start, as far as reasons to start smoking go. It helps that Peter’s newfound nicotine addiction is actually pretty in character (as much as it’s possible for anything Peter does to be in character) given his love of throwing himself into unhealthy activities. And the depiction of his addiction, complete with fidgeting, incessant excuses to go out and smoke, and unwillingness to admit he has a problem are the most realistic behavior he’s had in a while. Impressively, “Secondhand Spoke” captures one of the things that most entertainment of this sort doesn’t—smoking is cool (sorry, mom), even though you probably shouldn’t do it. Everything Peter says is extremely important said through a cloud of smoke, and he blows smoke letters. But, as Peter notes, everyone looks like Emperor Palpatine. After a few attempts to quit through Dr. Hartman and a rehab center, Peter winds up the face of an anti-smoking campaign, only on the condition that he keep smoking. The decision to introduce the ad men running the campaign rather than merely having the episode be about Peter deciding to quit smoking is smart, even if they dump him after a few minutes. Having Peter just struggle to quit in rehab would probably have been hokier than usual, and the ad jokes give Peter a job that he cares about (and a silly little PSA about what your heart looks like on cigarettes). Eventually, Peter just sort of decides that he needs to quit, but is forced to contend with the fact that he’s done irreparable damage to himself, in the episode’s only serious moment about the perils of smoking. 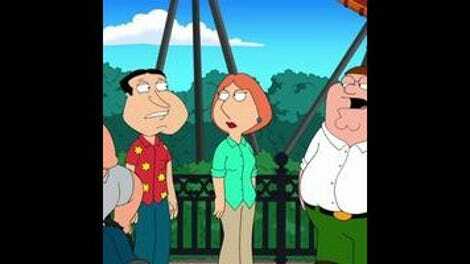 Family Guy has never been known for having a light touch, but as anti-smoking messages go, this was pretty subtle. Over in the B-plot, Stewie uses his intelligence to try to teach Chris how to come up with comebacks. Of course, Chris is unable to perform and Stewie is forced to become a quick-witted Cyrano de Bergerac to provide him with insults, which turns Chris into a real Cyrano when a girl is impressed by his verbal acumen, and then a legitimate contender for class president (up against “over-enthusiastic black student”). Chris’ willingness to kidnap Stewie was maybe a little over the top, but also the sort of thing you just have to go with on this show, and the plot gave Seth MacFarlane the opportunity to read a few zippy one-liners and elaborate insults, which is always fun. And the B-plot ends with a similar joke, when Chris and Stewie realize a couple of the bullies they’d fought against had committed suicide. Again, this was a somewhat underplayed reminder of the consequences of their actions, which is rare enough around Quahog. Mostly, I just hope the rest of the season is like this. 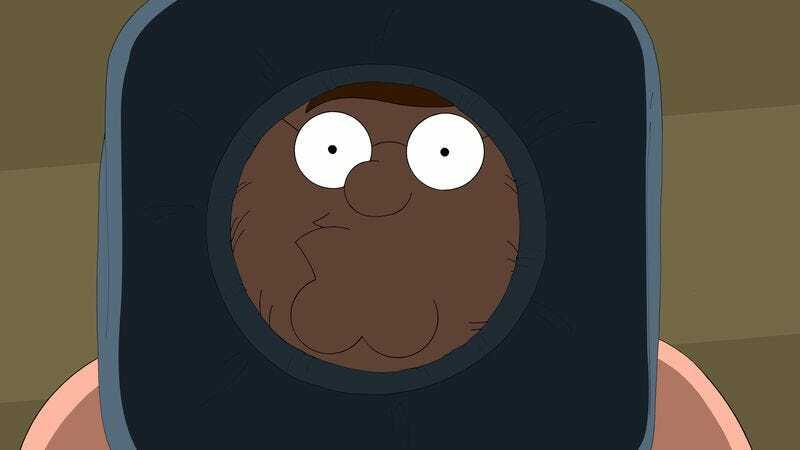 Family Guy has leaned pretty hard on meta-gags of late, but I laughed pretty hard at Peter trying to “just cut to the outside of the house” to cure the damage to his heart and lungs, only to discover he was stuck with his health problems. Peter will be fine next week, but a self-aware joke about sitcom reset buttons that’s also an anti-smoking PSA is pretty impressive. I am way, way in the tank for that Owl And Costello cutaway. An anti-smoking PSA aired during one of the commercial breaks. I’m not sure if it was funny, or sad—thoughts?